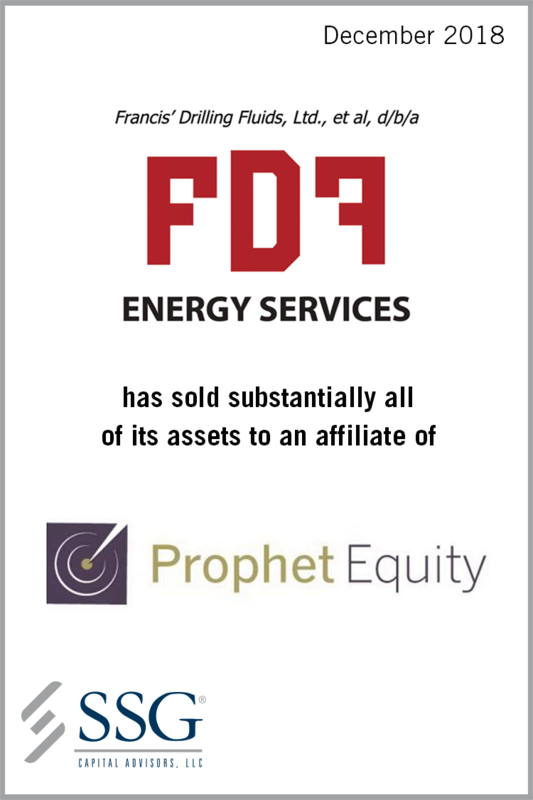 SSG Capital Advisors, LLC (“SSG”) acted as the investment banker to Francis’ Drilling Fluids, Ltd., d/b/a FDF Energy Services (“FDF” or the “Company”) in the sale of substantially all of its assets to an affiliate of Prophet Equity (“Prophet”). The sale was effectuated through a Chapter 11 Section 363 process in the U.S. Bankruptcy Court for the Southern District of Texas, Houston Division. The transaction closed in December 2018. Based in Lafayette, Louisiana, FDF is a leading provider of energy services supporting both onshore and offshore drilling activities throughout the United States. The Company offers pneumatic transportation, drilling fluids and cleaning services to some of the largest oil and gas exploration and production companies in the country. FDF has successfully served customers since its founding in 1977 with its facility network strategically located near major U.S. shale plays including the Permian, Haynesville and Eagle Ford basins as well as the Gulf of Mexico. The Company has established itself as a market leader by offering a complementary portfolio of high quality products and services while providing a safe, balanced work environment for its employees. FDF’s business was negatively affected by the sustained downturn in the oil and gas industry brought on by low commodity prices. This general market decline, coupled with lost revenue streams and increased driver and fleet maintenance costs, led to a decrease in profitability and the Company’s inability to meet its debt service requirements. Despite these challenges, FDF remained profitable. To recapitalize the business and take advantage of near-term growth opportunities, the Company retained SSG as its exclusive investment banker to assist in the exploration of strategic alternatives. After conducting an expedited pre-petition marketing process, the Company filed for Chapter 11 bankruptcy protection in September 2018 in order to effectuate the sale of the business. SSG subsequently conducted a comprehensive post-petition marketing process which produced multiple letters of intent from both strategic and financial buyers. Prophet’s stalking horse bid was ultimately determined to be the highest and best price for substantially all of the Company’s assets. SSG’s experience running and soliciting offers in an expedited Chapter 11 sale process enabled FDF to maximize the value of its assets while preserving the ongoing operation of its business. Prophet Equity is a private equity firm that makes control investments in strategically viable, asset-intensive, underperforming companies. Representative business situations have included special situations, succession planning, recapitalizations, reorganizations, turnarounds, acquisitions, and bankruptcies. • John T. Young, Jr. of Conway MacKenzie, Inc., financial advisor to the unsecured creditors committee.